The Age of Reverse Mortgages, which I wrote about in April, is here. 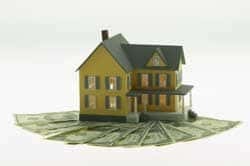 We can credit a new form of reverse mortgage, the Saver Home Equity Conversion Mortgage (HECM), for getting the ball rolling. The Saver HECM reduces the front-end mortgage insurance costs by lowering the credit limit for the mortgage. How could a small change open a floodgate of interest? Simple. First, it’s not such a small change. Second, millions of retired homeowners are looking for ways to increase their retirement income. As a practical matter, I don’t see the cost reduction is that big a deal. Using an online calculator, I found that a reverse mortgage on a $250,000 house would cost $11,626 in fees for the earlier form and $8,151 for the new Saver form. To learn more, visit the HUD website. So let’s do some back of the envelope calculations. Robert and Robin are 65 and own a $250,000 house with no mortgage. They are looking for more retirement income. Using the ibis online reverse mortgage calculator, they find that they can get a principal limit (the maximum amount they can borrow) of about $159,000. This will net them a credit line $147,624 after paying fees of $11,626. That, in turn, will provide them with a tax-free monthly payment of $822 for as long as they occupy the house. Twenty years later, at age 85, one dies and the other goes to a nursing home. Is anything left for their kids? It all depends on what has happened with home values over the period. The amount owed (principal advanced plus accumulated interest) will have compounded to about $380,000 over the 20 years. If the house appreciates (or inflates) at 3 percent a year it will be worth about $450,000. At 4 percent the house would be worth about $550,000. If they die or leave the house earlier, the accumulated debt against the house will be smaller. In any case, what’s left will be a roll of the dice, but they have some upside. Not a lot, but some. Now lets compare it to two more common life income alternatives. Life Annuity. If the couple tries to get a joint and survivor life annuity for $822 a month, immediate-annuities.com indicates that they would need to make a payment of $165,000. If the money came from a retirement account, every bit of income would be taxable. If the money came from a taxable account, they would pay taxes on a portion of their life income. Equally important, once they purchased the life annuity, the financial assets in their estate would be reduced by $165,000. Variable Annuity with Living Benefits. To get a lifetime income guarantee of $822 a month from a variable annuity contract with living benefits the couple would have to deposit nearly $200,000 to a contract that promised a 5 percent payout, a fairly typical rate for an age 65 married couple. The cash value of the contract after that would depend on how a total withdrawal rate of about 8 percent (payout plus product expenses) affected the value of the underlying account assets. The amount left would be another roll of the dice, but the ups and downs of markets would make a significant reduction in end value likely. Since both the life annuity and variable annuity would have to be purchased from existing financial assets, the couples’ financial flexibility would be reduced compared to using a reverse mortgage. Used for long term planning rather than emergencies, reverse mortgages are likely to become a major tool for the millions of Americans who have a lot more equity in their homes than in their retirement savings.